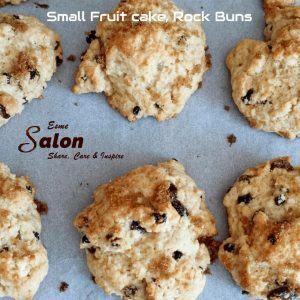 A rock cake is a Small Fruitcake, Rock Buns with a rough surface resembling a rock. Rock cakes originated in Great Britain, where they are a traditional teatime treat but are now popular in many parts of the world. Add butter, and rub into the flour with the tips of your fingers until the mixture resembles sand. Add the sugar and cake mix (dried fruit) and mix well. Stir it into the flour mixture to make a moist but firm dough. Brake dough into 12 equal heaps (it should not be a neat ball, so do not over handle it) onto the prepared baking tray. Bake in heated oven for 15 to 20 minutes, rotating the pan halfway through the baking time, until risen, golden brown and firm. Remove and place on a wire rack to cool before eating. I have been reviewing the recipes since I joined your forum … and finally I have found one I can’t resist. I just gotta try this one! Thanks Billy – I must admit it’s a favorite in my household as well. Oh my these would be great with my afternoon tea. Thanks so much for sharing Esme’.